We take the fall to plant trees and shrubs to give a new look – or rather an “original” look – the park of our museum: adding plantations and by redesigning the flowerbeds on the northern edge of the park giving on Helvetiaplatz, the original look of this beautiful garden will indeed be restored gradually and gently. 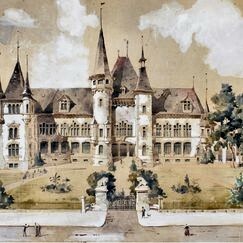 This redevelopment is based on a design by the architect André Lambert (pictured), who also designed the Castle Museum. The entire site is now a historical monument. Dear Reader, you may follow this link to added information ….